Home, recently completed and the tallest residential block in Paris since 1977, stands out other ways. Not least it bridges a divide between social and private housing. Herbert Wright visited it, with architect Jean-Christophe Masson of Hamonic + Masson. The Boulevard Périphérique famously encircles Paris proper, and beyond it lay 'les banlieues', a vast urban splatter across the Île-de-France, characterised by social housing and a history of tensions that has periodically flared into riots. Paris has been making strides to bridge the chasm. 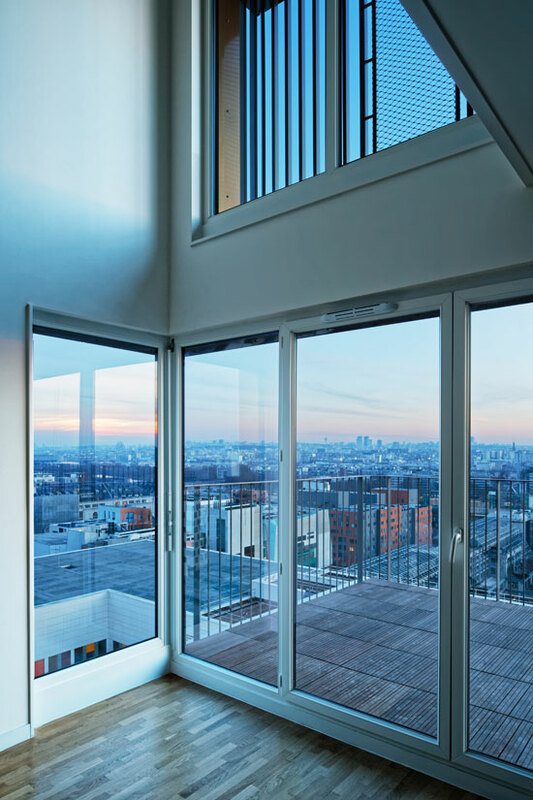 A new €1.2million residential development called Home, just within the Périphérique in the thirteenth arrondissement, aims to bridge the social gap within a single building. 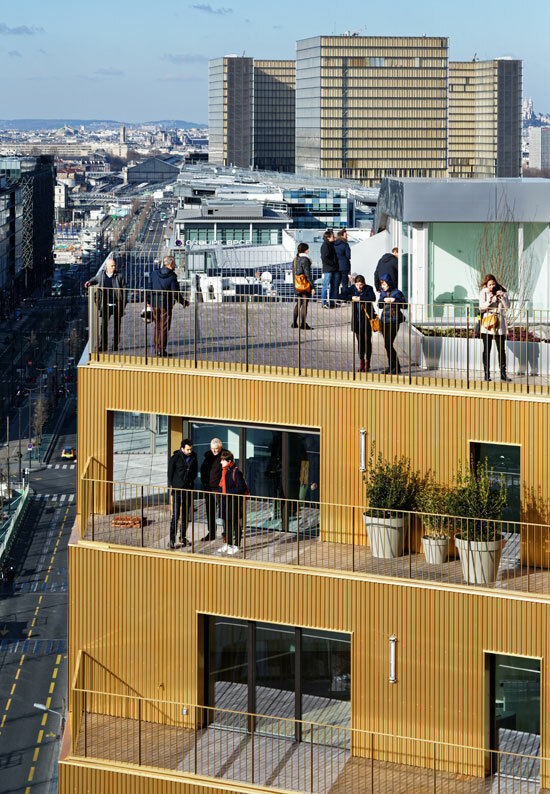 It's 'very pedalogical, it's a demonstration,' says Jean-Christophe Masson of Paris-based Hamonic + Masson, who designed the double-towered block in partnership with Nice-based architects Comte Vollenweider. Home had to respond to an unusual location, the Avenue de France. This is not a nineteenth century Haussman boulevard, but rather the most recent boulevard in Paris, commenced in 1995. It runs alongside the rail tracks from the Gare d'Austerlitz, which lie in a trench. By 2020, TGVs will be routed into the terminus. That means new build near to it needs to be proofed against serious train vibration. Home's structure is isolated by 330 damper boxes, blue and visibly wedged above walls and columns in its basement car park below the building. (If HS2 ever gets going, England will see a lot of such contraptions). The private tower is topped with a communal roof terrace and a pavilion with a 'summer kitchen'. The Bibliothèque nationale is in the distance. The other challenge the Avenue de France presents is to break the monotony of its rigid, rectangular blocks, all in a row and eight storeys high. Home disrupts this with two towers whose floors skew as they rise from a shared podium. In 1977, Paris re-instituted height limits at 37m, which one of Home's towers reaches. This contains 92 apartments for the private market. The other tower is Paris' first since 1977 to reach 50m, the new residential buildings height limit set in 2011, and it has 96 units of social housing. The gap between them lets light fall on a college building behind Home. Home has an aluminium skin, which on its avenue facade is left silvery in the lower tower, while the taller one has a golden hue which continues in the towers' gap. The exterior is further warmed by transparent orange screens interspersed with railings and full-height rods around the balcony edges. Masson sees these balconies as platforms for residents to interact, at least visually. When people are on balconies in the gap, facing the opposite tower, he says, 'it's like they're presenting themselves in public, like the Queen'. This may sound hopeful, but the social dimension is informed by his own childhood, spent partially in Le Corbusier's Unité d'Habitation. In the private tower, all residents have access to a 'cuisine d'été' (summer kitchen) and terrace on the roof. The social housing tower offers duplexes at the top. The different floor plans result in a big variety of apartment configurations, including duplexes at the top. From there especially, the view is magnificent- high above the tracks, a panorama of older social housing stretches beyond the Péripérique and also into the arrondissement itself, south of Place d'Italie. The towers of Dominique Perrault's Bibliothèque nationale (1996) dominate the horizon to the north, their bronze hue resonating with Home's pallette. And the immediate surroundings will soon have more to offer. Next to Home, Edouard Francois' titanium clad Tour de Biodiversité with a rooftop forest has already topped out, and just beyond it, the foundations of a 180m office tower by Jean Nouvel have been laid. 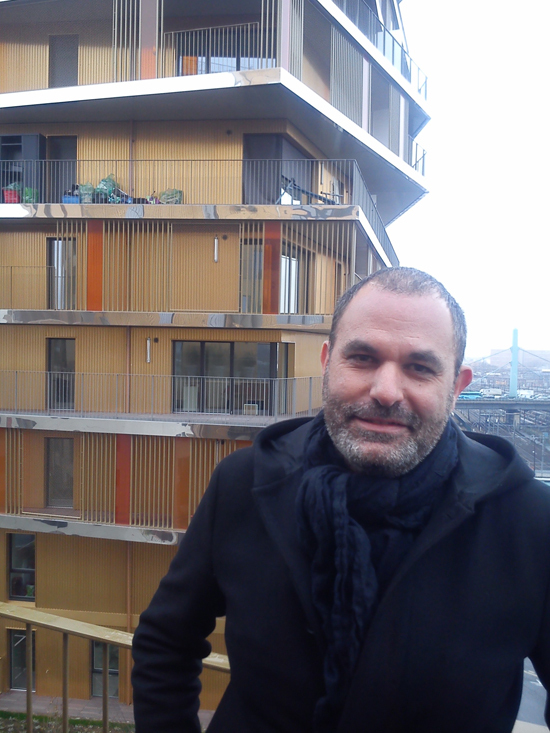 The thirteenth arrondissement has become something of a test ground for evolving urbanist ideas, and Masson likes the idea that 'we can have social experiments'. Home literally bridges the gap between social and private (and puts UK affordable housing quotas to shame). It also brings a spatial dynamism and electric materiality to what was until recently a dull domain- the edge of Paris.